User Experience @ NCSU: Opp: participate in mobile search experiment, get cupcakes and extra credit! 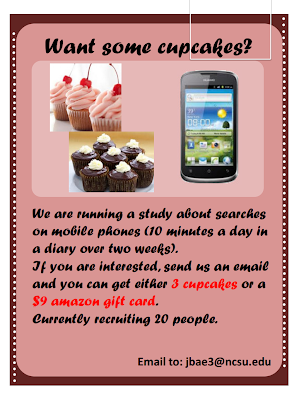 Opp: participate in mobile search experiment, get cupcakes and extra credit! Our lab is trying to learn about how people perform searches on mobile phones, asking users to write details about their searches for 5-10 minutes a day in a diary we give them, over two weeks. As a thanks, we'll give you either $9 credit at amazon or 3 very nice cupcakes! And, some extra credit in this course.